The occurrence of alcoholic hepatitis entails several pathophysiologic abnormalities which will affect diagnosis and management. When a person consumes large amounts of alcohol over a span of many years, the body naturally undergoes physical and biochemical alterations. For example, there is an increase in fatty acid synthesis as well as inhibition of fatty acid oxidation. This leads to deposition of fat in the liver and damage to that important organ. There will be inflammation, fibrosis, and death of liver tissue [1, 2]. These patients tend to have enlargement of the liver or spleen, and physician examination of the abdomen via palpation results in discomfort or tenderness for the patient. There may be jaundice or yellowish discoloration of the skin, fever, mental status changes, and swelling of the abdomen. Also, the individual may suffer from fatigue, weight loss, nausea, vomiting, and abdominal pain [1, 2]. Swelling of the abdomen in these clients is the result of fluid accumulation or ascites. There may be gastrointestinal bleeding, hepatic encephalopathy, and other clinical signs of portal hypertension such as dilation of veins of the abdominal wall. Those with advanced disease are likely to have this type of presentation [1, 2]. Moreover, the parotid gland may undergo enlargement. The pathophysiologic changes of this well-known disease will result in elevation of liver function tests. They may have macrocytic anemia and high white blood cell counts. There are commonly clotting abnormalities and a decline in the platelet count. Prolongation of clotting measurements such as prothrombin time and international normalized ratio is common [1, 2]. Serum bilirubin, creatinine, and blood urea nitrogen, of course, will be abnormal in most of these patients. The elevation in blood ammonia will contribute to the mental status changes should they develop hepatic encephalopathy. Many of these laboratory examinations, as well as age of the patient, will also serve as valuable parameters to indicate how well the client will do in the long run. [1, 2]. Alcoholic liver disease is well-known to clinicians as the excessive consumption of beverages has long been the reason for its occurrence. Drinane, M. and Shah, V. (2013). Alcoholic hepatitis: Diagnosis and prognosis. Clinical Liver Disease, 2, 80-83. 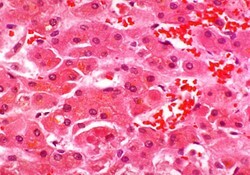 The photo is a microscopic view of human liver and shows Mallory bodies, which are present in some patients with alcoholic hepatitis.